COP21 was one of the largest gatherings of world leaders ever seen. Climate change is one of the biggest challenges facing the world today. 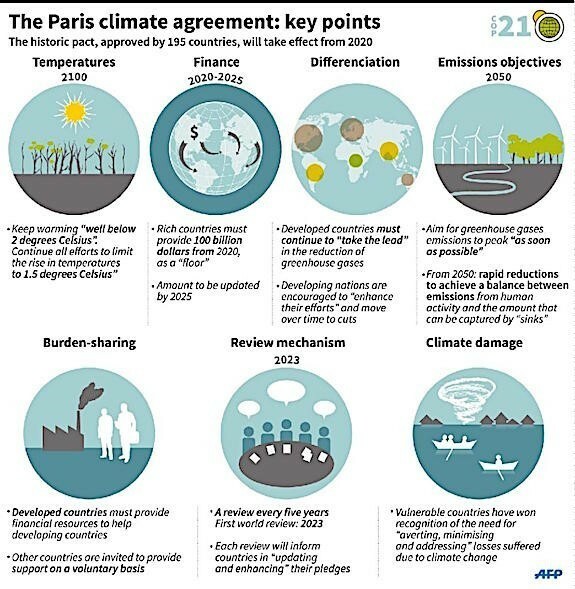 The Paris climate agreement is a pact, signed in December 2015 by 195 countries, to keep global temperature increase well below 2C, and if possible, below 1.5C. Known as COP21 (The 21st Conference of the Parties to the UN Framework Convention on Climate Change), it was one of the largest gatherings of world leaders ever seen. The agreement has just come into force. The parties to the agreement have said they will do a range of things to reach their goal. One of the main ones is bringing about a significant reduction in greenhouse gas emissions. Another is pledging a substantial amount of money to make this happen. The agreement is set to be reviewed every five years. There are different expectations for developing and developed countries. The agreement makes clear that developed countries must take the lead in the reduction of greenhouse gases. They must also provide financial resources to help developing countries succeed in their aims. 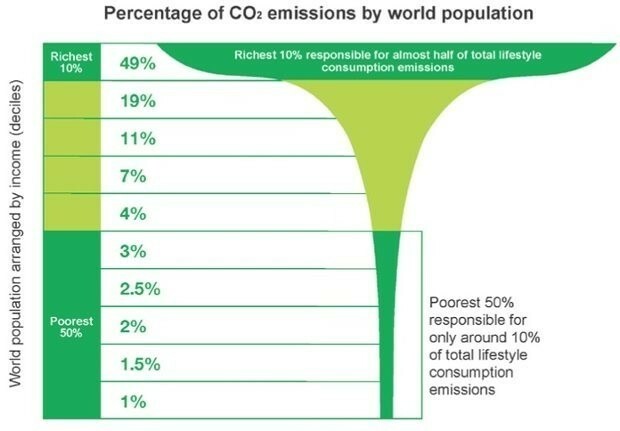 According to a report released by Oxfam last year, the richest 10% of people produce half of Earth’s climate-harming fossil-fuel emissions, while the poorest half contribute a mere 10%, as this chart shows. What needed to happen for it to come into force? Although the wording of the agreement was reached last December, there were various steps that had to happen for it come into effect. The Paris meeting was where the agreement was adopted. Then it needed to be officially signed. And finally, countries had to join the agreement. This last step involved getting the necessary approvals from respective governments. Fifty-five countries, or enough to bring the total global emissions to 55%, were needed before the agreement could come into effect. To date, 97 have joined, representing 69.22% of global emissions. This means that the agreement has officially come into force. The race to combat climate change has never been more important. Earth is getting hotter, and it’s happening faster than we thought. 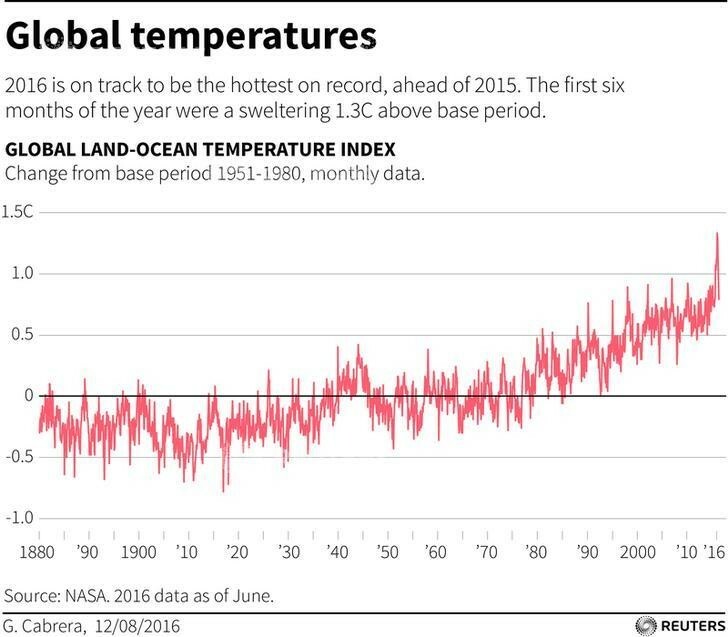 This year is on track to be the hottest on record. As this chart shows, the first six months of the year were 1.3C above normal levels, and temperatures have been steadily increasing since the second half of the 20th century. In fact, we are already in danger of not reaching the agreement’s target of between a 1.5 and 2C rise in temperatures. The United Nations Environment Programme (UNEP) annual report looked at countries’ current pledges for emissions cuts. It says that, even if current pledges are fully implemented, predicted emissions could see temperatures rise by 2.9-3.4C above pre-industrial levels by 2030. This is far above the 2C of the Paris climate agreement. It calls it the “emissions gap”. At the G20 summit last summer, China and the US announced that they had ratified the Paris Agreement. The announcement was significant because the US and China are the world’s two biggest polluters. This chart compares the carbon dioxide emissions from fossil-fuel use and industry of different nations. China, shown in dark red, is responsible for a large proportion of global emissions, while the US, in dark blue, is responsible for another hefty chunk. There is good news, however. 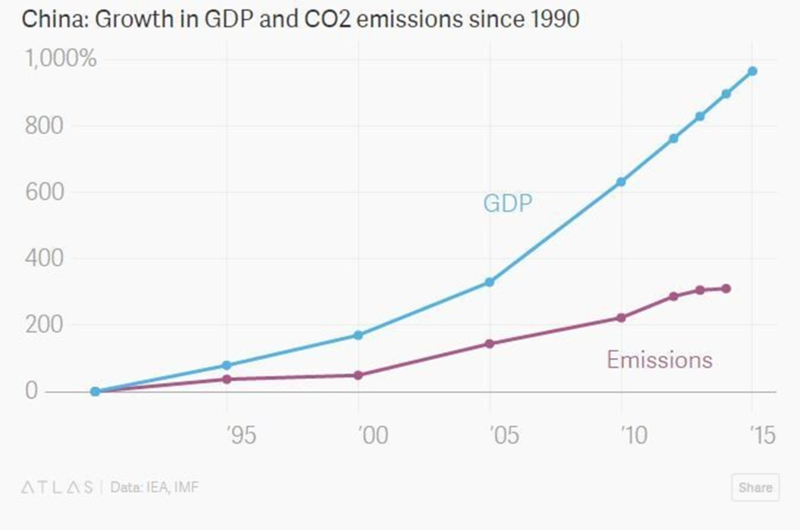 Up until 2014, GDP growth and carbon emissions went hand in hand. According to the International Energy Agency (IEA), energy-related CO2 emissions were flat in 2014, despite an increase of around 3% in global GDP. “This is the first time in at least 40 years that a halt or reduction in emissions has not been tied to an economic crisis,” the IEA said at the time. 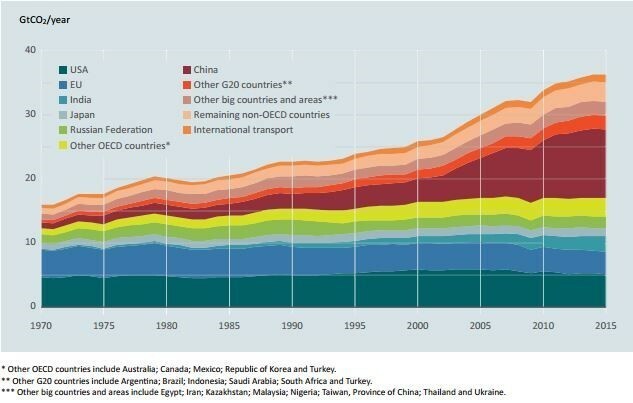 China was one of the countries where this happened, as the chart below shows, in part due to a massive push into renewable energy. Countries now need to put their promises into action. The follow-up meeting to COP21 takes place in Marrakech this month to consider the way ahead beyond Paris. “This is a moment to celebrate. It is also a moment to look ahead with sober assessment and renewed will over the task ahead,” United Nations' climate chief Patricia Espinosa said in a statement. “In a short time – and certainly in the next 15 years – we need to see unprecedented reductions in greenhouse gas emissions and unequalled efforts to build societies that can resist rising climate impacts,” she added.